Divorced mom Eva (Louis-Dreyfus) may be falling for Albert (Gandolfini), a sweet, funny, like-minded divorcé. But as their relationship blossoms, Eva befriends Marianne (Keener), who’s always complaining about her ex-husband. When Eva realizes that Albert is the target of Marianne’s rants, she begins to question her own perceptions about first impressions and second chances. I absolutely loved this movie! 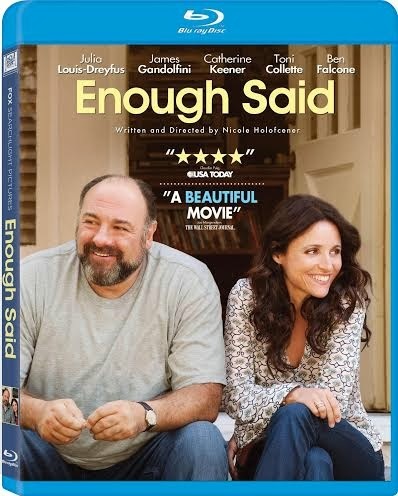 A romantic comedy, Enough Said, stars the always hilarious, Julia Louis-Dreyfus and the late, James Gandolfini. What happens after a divorce? Well life simply moves on and so do you. Two divorcee's meet and connect with great chemistry. But what do you do when you meet and befriend the guy's ex-wife and after becoming friends realize you're now friends with his ex? From beginning to end I just adored this movie. If you're looking for a new romantic comedy, definitely check Enough Said out. You won't be disappointed. This is definitely a movie you can watch with a girls night in or even on date night. Disclosure: All opinions are my own. I received Enough Said on blu-ray DVD at no cost for the purpose of this review. No other compensation was received.